thank you for visiting the FAT32 resource page, this site explains all the options and specifications of the new FAT32 file system for Windows. This page has been created to help answer some of the questions and confusions about FAT32 and its new features. New! CheckDrive, a free dos utility that helps to calculate how much space could be gained with the use of FAT32. OEM Service Release 2 (OSR2) of Microsoft Windows 95 (commonly known as Windows95b). This release of windows was released in the fall of 1996, and is only available with new PC's. Windows 98, FAT32 is included in the final release of the Windows 98 operating system. It also includes a FAT32 converter so you can convert an existing FAT drive to FAT32 without data loss. The existing File Allocation Table (FAT) file system was invented in 1977 as a way to store data on floppy disks for Microsoft stand-alone Disk Basic. Although originally intended for floppy disks, FAT has since been modified to be a fast, and flexible system for managing data on both removable and fixed media. The current generation of large hard disks have finally reached the limit of the existing FAT data structures. FAT currently can support a single disk volume up to 2 Gigabytes in size, with the increasing size of new hard drives this is an increasing problem. Every file on your system is stored in clusters in your hard drive, the maximum of one file can be stored in a particular cluster, so this results in wastage if the file is under the cluster size. The current FAT version (FAT16) organises files in 32K clusters in drives over 1.2gig, while FAT32 will use a minimum cluster size of 4K. This means that a 3K file wastes only 1K of disk space on FAT32, while it wastes 29K of space on a standard FAT system. This wastage can result in over 50% of a 2gig drive being wasted. See the table below. Note: Disk Size does not apply to FAT32 where the 4K cluster is usually used. Uses space more efficiently: FAT32 uses smaller clusters (e.g. 4kg clusters for drives up to 8GB in size), resulting in IO to I 5% more efficient use of disk space relative to large FAT drives. Note: The minimum size for a FAT32 partition is about 260 MB. More robust: FAT32 has the ability to relocate the root directory and use the backup copy of the FAT instead of the default copy. In addition, the boot record on FAT32 drives has been expanded to include a backup of critical data structures. This means that FAT32 drives are less susceptible to a single point of failure than existing FAT volumes. More flexible: The root directory of a FAT32 drive is now an ordinary cluster chain, so it can be abnormally large and located anywhere on the drive. In addition, FAT mirroring can be disabled, allowing a copy of the FAT other than the first to be active. These features allow for dynamic re-sizing of FAT32 partitions. Note: while the FAT32 design allows for this compatibility, it is not implemented by Microsoft in the initial release of OSR2. In order to maintain the greatest compatibility possible with existing applications, networks and device drivers, FAT32 was implemented with as little change as possible to Windows 95's existing architecture, internal data structures, Application Programming interfaces (API's) and on-disk format. However, because 4 bytes are now required to store cluster values, many internal add on-disk data structures and published APf's will fail on FAT32 drives. Most applications will be unaffected by these changes. Existing utilities and drivers should continue to work on FAT32 drives. however, MS-DOS block device drivers (e.g. ASPIDISK.SYS) and disk utilities for these will need to be revised to support FAT32 drives. All of Microsoft's bundled disk utilities in Windows95b (format, FDISK, Defrag, MS-DOS and Windows Scandisk, and DriveSpace) have been revised to work with FAT32. In addition, Microsoft is working with leading device driver and disk utility vendors to support them in revising their products to support FAT32. Norton Utilities version 2 for Windows 95 fully supports FAT32. For most users, FAT32 will have a negligible performance impact. Some applications may see a slight performance gain from FAT32. In other applications, particularly those heavily dependent on large sequential write operations, FAT32 may result in a modest performance degradation. The overall effect on raw disk performance is less than 5% however, and the overall impact on application performance as measured by Winstone is typically less than 1%. Drive defragmenting becomes a lengthy process due to the large number of clusters. At this time, Windows 95 OEM Service Release 2 and Windows 98 are the only operating systems capable of accessing FAT32 volumes. Windows 3.1, MS-DOS and the original version of Windows 95 will not recognise FAT32 partitions, and thus they are unable to boot from a FAT32 volume. Microsoft plans to add support for FAT32 in Windows NT5, but at this time , Windows NT is unable to access, or dual boot from FAT32 volumes. At minimum, Microsoft will provide a utility to convert a FAT32 volume to an NTFS volume in NT5. However, there is a free FAT32 reader available for NT from SytemInternals, there is also a read/write edition available for around $40. However, you cannot use the program to boot NT off a FAT32 partition. Customers who run Windows 95 real mode (for example, to run a game) will be able to use FAT32 volumes. Windows95/98 protected DOS mode does include the FAT32 driver. 1. In OEM Service release 2, if you run the FDISK utility on a large system with a drive over 512MB, it will ask whether to enable large disk support. If you answer yes, any partition you create that's greater than 5I2MB will be marked as a FAT32 partition. FDISK cannot convert a FAT16 partition to FAT32, all contents of the drive are lost if you use this method. 2. Partition Magic 3 can convert partitions to FAT32 on-the-fly without data loss, this is probably the best method currently available, it can also convert back to FAT16 if required. See the PowerQuest site for more information on this product. 3. Windows 98 includes a graphical FAT32 conversion utility, which quickly and safely converts a hard drive from the original FAT to FAT32. You can also start FAT32 Converter by clicking Start, Programs, Accessories, System Tools, and then clicking FAT32 Converter. Notes on the Windows 98 FAT32 converter: If you convert your hard drive to FAT32, then you cannot uninstall Windows 98 without reformatting. Once you convert your hard drive to the FAT32 format, you cannot return to using the FAT16 format unless you repartition and format the FAT32 drive. If you converted the drive on which Windows 98 is installed using FDISK, then you must reinstall Windows 98 after repartitioning the drive, you do not have to do this if using the converter. The converter also requires drives to be over 512meg to be converted even though the actual FAT32 standard allows drives as small as 260 MB to be created. The 512 MB limit was probably set by Microsoft to gain maximum performance on FAT32 drives. Important: Before you perform any function on your hard disk, it's a good idea to backup all your data. Also create a new Windows 95 startup disk! Why Not Just Add NTFS To Windows95/98? NTFS is an advanced file system, with support for many features not present in FAT32, including per-file compression, security and transactioning. It is not feasible to implement NTFS within the memory and compatibility constraints of the Windows 95 platform. Windows 95 still supports real-mode MS-DOS for booting and running some MS-DOS based games. Adding NTFS support to the MS-DOS kernel would have required a significant amount of MS-DOS memory, and that would have precluded the use of many MS-DOS mode games and applications. Protected-mode's only support for NTFS would not have allowed Windows to boot from an NTFS volume. However, there is a free NTFS reader for DOS/Windows9x available from SystemInternals. Note : this only supports read-only operations. Two new partition types are defined: OxB and OxC. Both indicate FAT32 volumes; type OxC indicates a FAT32 partition that requires extended INTI3 support (LBA). The boot record on FAT32 drives requires 2 sectors (due to expansion and addition of fields within the BPB). As a result, the number of reserved sectors on FAT32 drives is higher than on FAT16, typically 32. This expanded reserved area allows two complete copies of the boot record to be stored there, as well as a sector in which free space count and other file system information is stored. The root directory is no longer stored in a fixed location. A pointer to the starting cluster of the root directory is stored in the extended BPB. The on-disk format directory entries is unchanged, except that the two bytes previously reserved for Extended Attributes now contain the high order word of the starting cluster number. MS-DOS APls that rely on intimate knowledge of the file system layout generally fail on FAT32 drives. For instance, GetDPB (int21 h, function 32h), Int 25/26h Absolute disk read/write, and most of the Int 21 h, function 440Dh IOCTLs will fail on FAT32 drives. New forms of these APls are provided in OEM service release 2 which work on all FAT drives. Win32 APls are not affected by FAT32, with the exception of one additional API called GetFreeSpaceEx() for determining the true free space on a FAT32 volume. Once you convert your hard drive to the FAT32 format, you cannot return to using the FAT16 format unless you repartition and format the FAT32 drive, or use a conversion utility like Partition Magic, but this cannot be 100% reliable. If you have a compressed drive, or want to compress your drive in the future, you should not convert to FAT32. If you have a removable disk that you use with another operating system, don't convert to FAT32. Hibernate features (suspend to disk, for example) will not work on a FAT32 drive. Although most programs are not affected by the conversion from FAT16 to FAT32, some disk utilities that depend on FAT16 do not work with FAT32 drives. Contact your disk utility manufacturer to see if there is an updated version that is compatible with FAT32. If you convert your hard drive to FAT32, you can no longer use dual boot to run earlier versions of Windows (Windows 95 [Version 4.00.950], Windows NT 3.x, Windows NT 4.0, and Windows 3.x). However, if you are on a network, earlier versions of Windows can still gain access to your FAT32 hard drive through the network. The minimum size for a FAT32 partition is about 260 MB. However, if you use the Windows98 FAT32 converter, it requires drives to be at least 512 MB in size before they can be converted. This is done to gain maximum performance. CheckDrive - is a free dos utility that scans your hard disk and calculates your cluster efficiency. It displays the space wastage of your data on different cluster sizes, and which cluster size is currently being used. It also produces a FAT efficiency percentage. This program helps to calculate how much space could be gained with the use of FAT32. 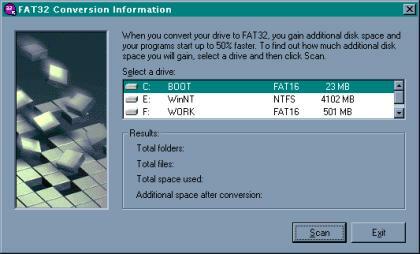 FAT32 Conversion Information - a small program produced by Microsoft which allows you to scan your existing FAT16 partitions and find out how much additional disk space you would gain from FAT32. Copyright © 1997-2005 Project9. All rights reserved.